Since the Six Dynasties, a large influx of foreigners from different parts of Eurasia brought to China exotic arts and goods, novel ideas and knowledge. Among these was the astral science of the “West”, a highly idiosyncratic body of astronomical knowledge including meteorology, metrology, calendrics, astronomical measurement, to the more arcane arts of omen reading, apotropaic magic and horoscopy. The new “astral science” of the West was drastically different from the Chinese’s and became highly sought after by the progressive rulers and elites. The legacy and impact of this early contact of the East and the West has remained largely unknown to the scholarly world until manuscripts and fragments from the Silk Road were rediscovered and compared with texts in Greek, Sanskrit, Syriac, Sogdian and other languages. Bill M. Mak completed his linguistic training at McGill University (B.A. Hons.) specializing in Sanskrit and East Asian languages and received his Ph.D. in Indian literature and Buddhist philology from Peking University. 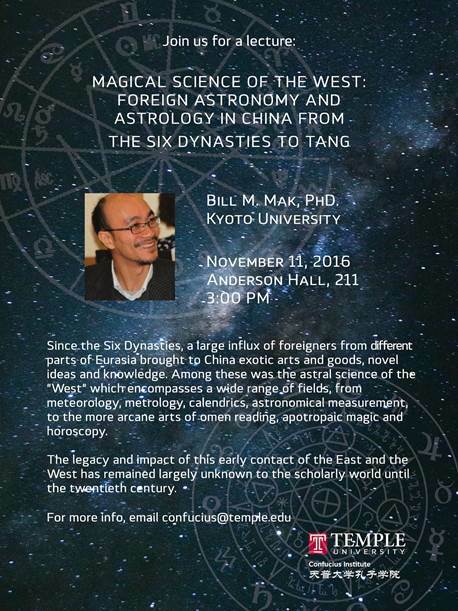 Mak held research and teaching positions at Hamburg University, University of Hong Kong and Kyoto Sangyo University, before his current appointment as Associate Professor at Kyoto University and Visiting Research Scholar at the Institute for the Study of the Ancient World, New York University.